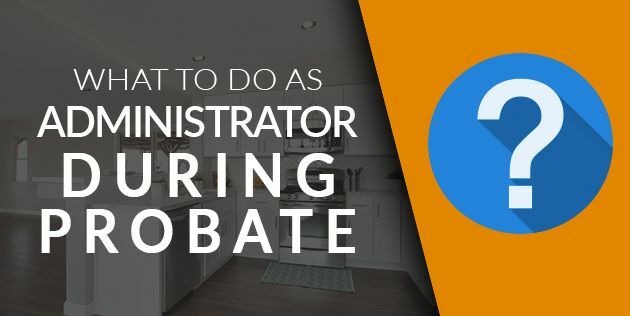 What Should I Do As The Administrator During The Probate Process? Home » Blog » What Should I Do As The Administrator During The Probate Process? The probate process is never fun, especially if you don’t know what to do. As the administrator during the probate process, you are responsible for the legal matters of the estate. There are a lot of very important decisions to make. The best thing you can do is make sure every decision you make is an informed decision. Probate starts with filing a petition. If the will already explains who the executor is supposed to be, you can hand the will over to the court.If there is no will, the named executor is deceased, or the named executor doesn’t want to be the executor, you’ll have to file a petition from scratch. If you and the other heirs can’t agree on who should be the executor, the court can decide. The court publishes the probate in the newspaper to notify creditors that the family may not be aware of. You need to notify creditors you know about and tell them about the probate. You’ll have to take an inventory of the entire estate. This includes personal effects and any assets that can be liquidated (like stocks, bonds, interest, etc.). You can hire an appraiser if you need to. Then, it’s time to settle debts. All the debts left behind are to be paid from the estate – not out of your pocket. If the estate can’t pay the debts, it doesn’t fall back on you. All you have to do is make an honest effort to settle debts, and some creditors may work with you to reduce the amount owed. These debts include any relevant taxes and funeral expenses. Once that’s all squared away, the property is then transferred to the administrator. The court will go over claims made my creditors, and decide which ones should be paid. If anything that is leftover is supposed to go into a trust fund, the trusts will then be set up. You’re free to move things around after the court calls the debts settled. If a huge debt needs to be paid, the court might take special actions. In some states, the probate courts may require that the home be sold at a certain minimum price to pay those debts. If you are unaware of your state’s probate codes, you may need to do a little research. You have some important conversations coming your way. The last thing you need is everyone arguing about what to do during probate. This can cause more than a few arguments and awkward Thanksgiving dinners: other people who feel that they’ve been mistreated during the process may be able to personally sue you, or file claims against the estate. People are going to be a little upset – that’s normal. Just make sure you’re talking about what you’re going to do before you do it. Don’t make any moves unless everyone is aware. Let your family and the other heirs become a part of the decision process. Don’t leave any room for surprises. No matter what you decide to do, the home needs to be prepared. If you want to have an estate sale, sell the property, rent the property, or move another family member in, you have to deal with everything that’s been left behind. Bring a few trusted heirs or family members with you, and go through the home. Pack things up, and give the house a good cleaning. This may be especially necessary if the individual who owned the home was elderly, ill, or otherwise unable to care for their home. If the home is in bad shape, you may want to fix up the property. If you don’t or you can’t afford to, you still have some options. Now, it’s time to make the big choice. You need to decide whether to sell, rent, or keep the property. Keeping the property is the easiest thing to do. If you or a family member want to move in, it’s as simple as packing and unpacking. If you need the extra income from a rental, you need a large sum of money to cover expenses, or you just don’t want the home, you can become a landlord. Renting the property may have its perks, especially if you can make some money. Who couldn’t use a little extra money in their wallet at the end of the month? If you want to rent the property out yourself, you’ll have to look into becoming a landlord, and take on the responsibility of property management. If you don’t want the added burden, you can hire a property management company. You’ll be making less in profit, but you’ll also get a free pass on doing a lot of the dirty work. If you want to sell the house, you can go through a realtor, or an investor. If the house is worth a lot and the area has a fast moving real estate market, it may be worth checking out real estate agents. Just don’t forget they’ll take a commission. If the house sits on the market unsold for a while, the realtor may suggest reducing the price, but their commission will stay the same. With an investor, you may be getting less than what the home is worth. This has some distinct advantages, especially if the home is in bad shape or in need of major renovation. Rather than having to pay someone to work on the property, an investor will provide you with a quick cash offer that’s less the costs of repairs and renovations. You’ll get the money quickly, and be able to move on. At SCHB, we have years of experience buying houses of all kinds from people in situations similar to yours. We’re prepared to make you a fair cash offer on your unwanted probate home. We aim to keep things quick and easy for you. Submit the information about your home through our contact form, and we’ll be able to provide you with all of the information you need about a fast sale of your property. « Previous Post What Resources Are Available To Help Me Through the Probate Process? Next Post » Should I Rent or Sell My Inherited Los Angeles Home?